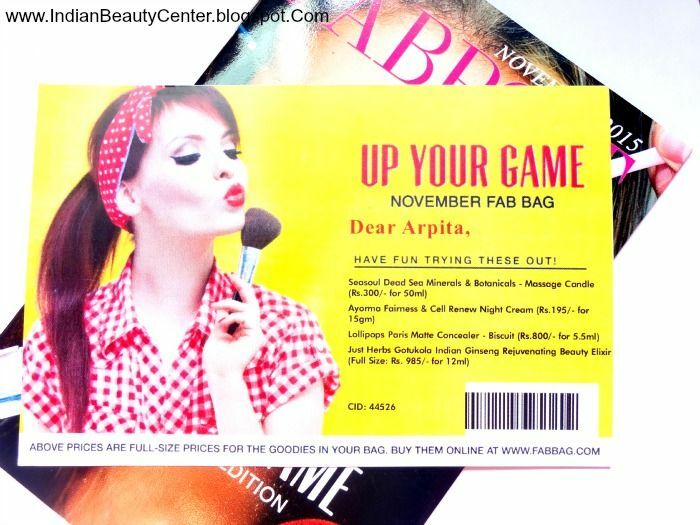 November 2015 Fab Bag Review, Unboxing, Price, Products, Fab bag November 2015. The first product that I got is the Ayorma Spa Fairness & Cell Renew Night Cream. I have already reviewed their Fairness and Anti-Tan Face Wash and it was really good. I am currently trying a lot of other Ayroma products and I like most of them. I already have the full-sized product of this night cream that has a fragrance of saffron. It costs Rs. 649 for 50g and I got a 15g sample size costing Rs. 195. 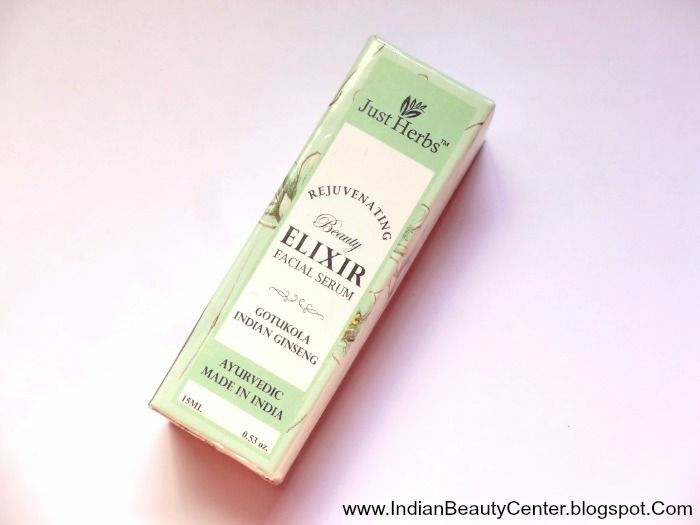 The second product that I got is the Just Herbs Gotukola Indian Ginseng Rejuvenating Beauty Elixir. I received full size of this product. 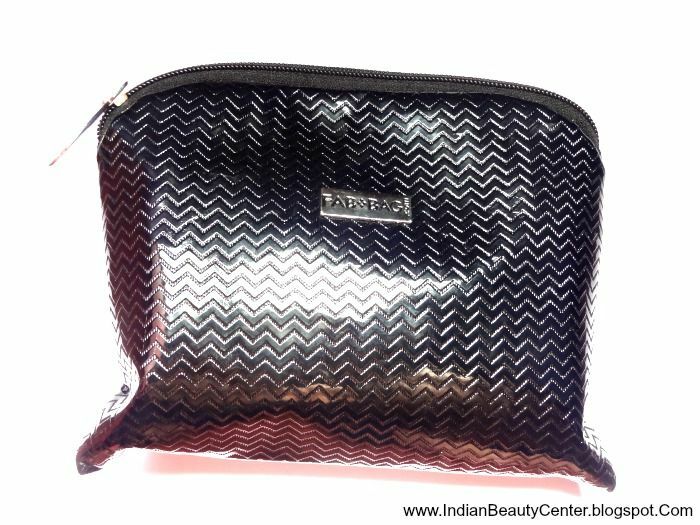 This time fab bag mailed me to choose one of their best sellers and so I chose this one. It costs Rs. 985 for 15ml and is a facial serum that claims to restore natural glow to the skin. I already am using this one at night and I must say, it's a good choice. 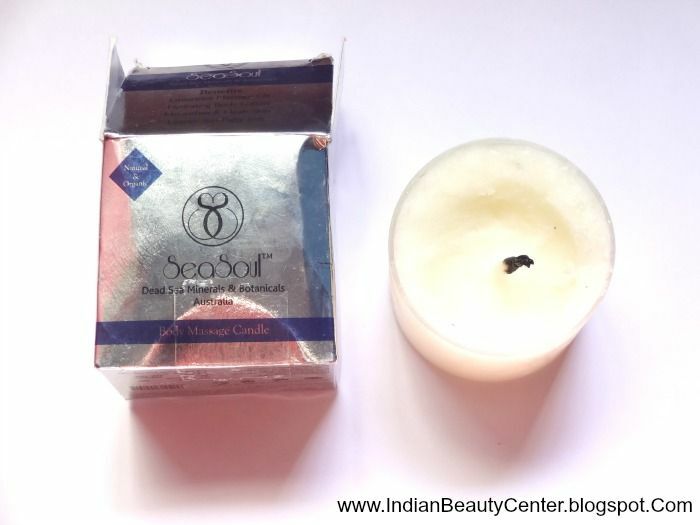 The third product that I got is the Seasoul Dead Sea Minerals & Botanicals Massage Candle, full-sized product. It costs Rs. 300 for 50ml. I have never tried a massage candle before. So, you have to wait till some of the candle melts and turns into liquid. Then, you need to extinguish the candle and pour some of the oil from the candle jar onto your palms and massage using the same. This sounds interesting and I love using massage oils during winters. It claims to increase blood circulation, replenish moisture and tone up the skin. Will see how this works for me. Lollipops Paris Matte Concealer is the last product that I found and it is full-sized. It costs Rs. 800 for 5.5ml and I found it in the shade 24 Biscuit, Paraben free, SPF 15. It's a bit dark for my skin tone. I have never tried Lollipops Paris before and I wish they asked me my matching shade before sending out this one randomly. I am disappointed with this shade in particular. Have never tried this brand so can't comment on the quality yet. It contains thousands of shimmer particles, which I do not like at all.